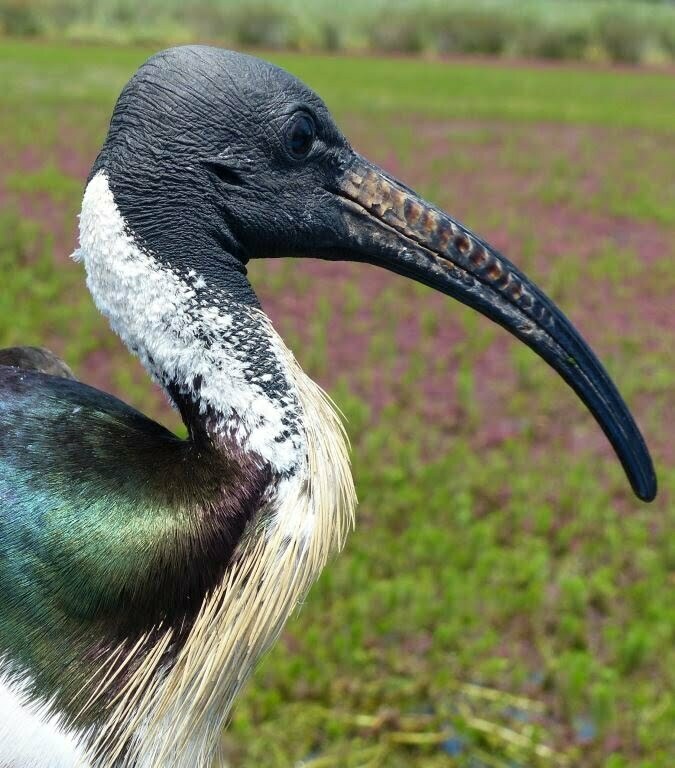 The case of the missing Ibis, a satellite tracker and some butcherbirds…..
As part of our Environmental Water Knowledge and Research waterbird project we are satellite tracking Straw-necked Ibis to see where they roost, breed, feed and travel. Some time ago we found ‘Gough Whitlam’, a male straw-necked ibis we were tracking, had died from botulism (a soil-borne bacteria) near Hillston. We could not, however, locate his transmitter and harness, despite the fact that we found his body and leg bands and the transmitter was still pinging its location exactly where we were looking! It was very frustrating. Since we were out that way again recently for a meeting, we decided to have another look. Despite being better equipped with a metal detector, ropes, rake, shovel etc. we were having real trouble finding the transmitter. After hours of searching, including inspecting trees and hollows above, and around the two main GPS points from which most transmissions had been received, there was still no satellite tracker. We sat down to have a rest and talk about what to do next. My plan was to bring our ladder in and start climbing to look into high tree hollows and do closer inspections of high branches. In the meantime, three young pied butcherbirds turned up. 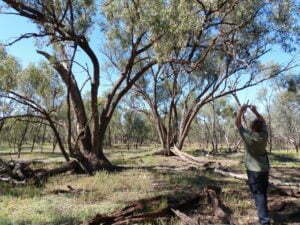 We were whistling at them and generally enjoying their curiousity, as they are intelligent and playful birds. After a while they flew to a branch about 5-10m away and started fussing with something. 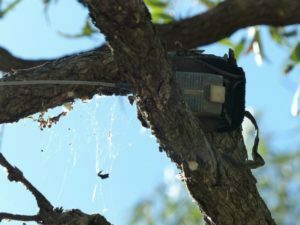 I had a golden moment of ‘hey, they’ve got something there’ – and yes they certainly did – our transmitter and harness ‘cached’ in a branch! Satellite tracker up a tree! It’s likely that these clever birds took the satellite tracker off the ibis body in the first place, as butcherbirds are known for liking shiny interesting things and for caching. We took photos of the cached transmitter in the tree, but unfortunately I didn’t get any pics of the butcherbirds as they flew off as we plundered their treasure. When we got the tracker down it was clear they had been working on it with their beaks for quite some time as paint was removed from certain parts! 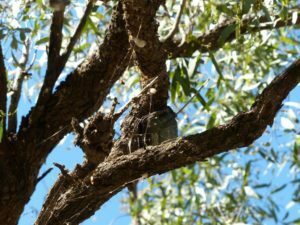 Case now solved, we stole back the butcherbird’s ‘treasure’ and left, grateful that we are birdwatchers and had stopped to have a think and listen to the birds around us. The pied butcherbird call is one of my absolute favourite calls and I thought you might like a little update from Wikipedia about this clever songster.